A curse is upon the land. An ancient barrow has been looted, and the dead has exacted their revenge. Brave heroes, who dare step onto Death’s doorstep are needed to lift he curse and restore order. Welcome to the sixth adventure translated from Danish to English in the line of Hinterlandet (The Hinterlands). The module has been adapted to Labyrinth Lord, and can be played with most D&D becmi inspired retro clones or otherwise easily adapted to your favorite D&D-game. Grave of the Heartless is originally from the convention HammerCon, and it was made to challenge the players with a dungeon, that was supernatural rather than natural. Even if dungeons require a stretch of imagination to accept, many are somewhat naturalistic with stone walls, patrolling goblins, kobolds digging mines and orcs setting up ambushes. Inspired by the local barrows near my childhood home, I decided to use a barrow as the starting point for the dungeon, and then create it as a border region between this world and the land of the dead, where the other realm suffuse the nature of the dungeon creating a slightly unreal place. That made it quite fun writing the adventure, but one of the challenges with ‘undead dungeons’ is adding creatures for the players to interact with. Zombies, ghouls and skeletons rarely do anything beyond killing heroes, and a whole dungeon of that is not interesting, so a way to add talkative creatures was needed, and is a central part of the challenge. The adventure introduces a powerful NPC, who can become an unusual ally, and to a certain degree sets up a gate to another realm for the characters to guard and use, or perhaps just keep secret until they need it. An interesting part of the adventure is, that there is no grand villain or boss monster at the end of the dungeon, but there is a powerful opponent. The adventure also easily functions as a sequel to Tomb of the Dragon’s Heart and fits easily into the storyline from the adventure The Flooded Temple. 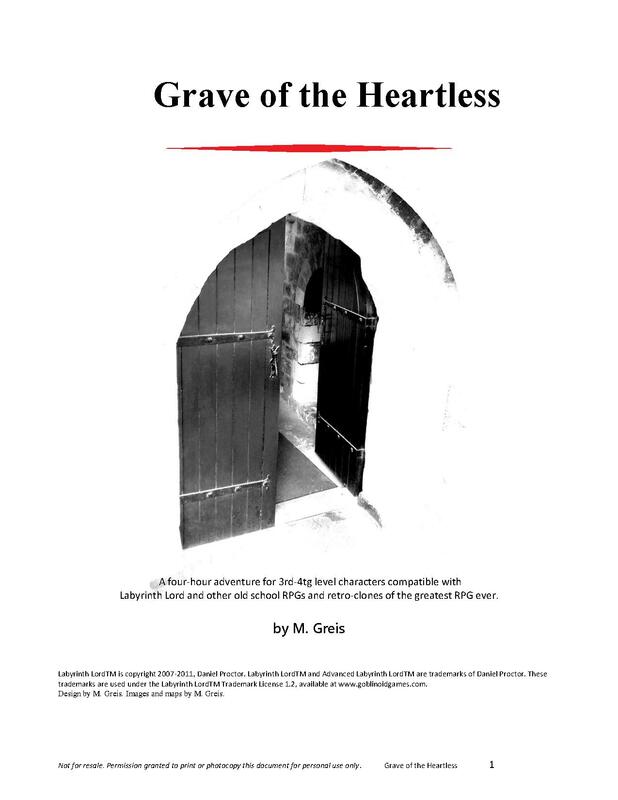 You can find Grave of the Heartless at RPGDriveThru: Grave of the Heartless.